A new ad released by ESAFund highlights Rep. Beto O’Rourke's (D., Texas) drunk driving accident and arrest in 1998. The ad begins with a narrator asking what's worse, "driving drunk or lying about it," followed by a clip of O'Rourke denying having left the scene of the accident. O'Rourke, the Democratic nominee for Senate in Texas, crashed his car in 1998 and was eventually arrested for driving while intoxicated. The Texas Democrat has long acknowledged what he describes as a "serious mistake" for his DWI arrest. The Houston Chronicle, however, reported new details this year on the severity of the accident. A police report from the incident revealed a witness stated O'Rourke attempted to leave the scene after he crashed his vehicle. 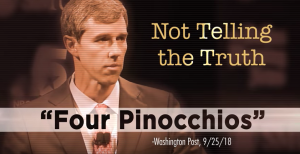 The Washington Post gave O'Rourke a Four Pinnochio rating for his statement denying he tried to leave the scene. ESAFund is running the ad nationwide on Monday and Tuesday on shows like MSNBC's "Morning Joe" and Don Lemon's show on CNN. The nationwide buy is in addition to a $1 million buy in Texas. "Seeing as more people who support Beto live outside of Texas than in Texas, we wanted to make sure they knew all about his record as well," ESAFund President Brian Baker said. ESAFund describes itself as an "independent organization that proudly supports candidates regardless of party affiliation who favor enhancing free enterprise, reducing the size of government, and balancing our nation's budget. We are also proud to strongly oppose those who do not." The group was formed by Joe Ricketts, who founded TD Ameritrade and whose family owns the Chicago Cubs.